You are not alone in your desire to restore the natural white and shining look of your teeth. Over 18% of Americans say that they shy away from smiling at cameras because their teeth are not white enough. Living in a cosmetically enhanced society, I do not find this statistic extremely shocking. There is a range of teeth whitening treatments available on the market today. Some involve dental procedures, while others involve you performing chemical experiments at home. If your best high school grade in chemistry was a “C”, I encourage you to stop looking at home remedies for teeth whitening that involve hydrogen peroxide. Luckily for you (and I) there are above-the-counter solutions that can help restore your teeth to their glorious shining days. Not the mouthwash type of person? No worries, here is our list of the nine top performing whitening toothpaste on the market right now! The majority of whitening products, not just mouthwashes, are chemically enhanced to a certain extent. There are a few natural products on the market that we feel strongly positive about and have rated in our reviews. Hydrogen peroxide is by far the most commonly used ingredient in whitening mouth rinse products. All big brands, such as Listerine, Crest, and Colgate are highly dependent on it. In order to be used as a bleaching agent, hydrogen peroxide has to be diluted down to a low pH level. This allows the compound to be mixed with other chemicals and help remove pesky stains from the surface of the teeth. Therefore, achieving a certain degree of whitening effect on the teeth. Dental teeth whitening procedures also use hydrogen peroxide, but in much higher concentration doses. As such, this compound is not unique to mouthwashes. If you want a faster acting whitening rinse, look for products that contain a higher degree of hydrogen peroxide. NOTE: Hydrogen peroxide solutions are highly acidic (pH 4.4 and up). Continuous rinsing with products containing the bleaching compound can be damaging to the enamel. Alcohol-free is something that we insist on when purchasing a whitening rinse. Alcohol is contained in quite a few above-the-counter mouthwash products, and we recommend you read the label before purchasing. Alcohol should only be used moderately during college parties. It is our view that alcohol enhanced oral products are a primary cause of dry mouths. Lack of saliva has been shown as a foundation for the formation of harmful bacteria and bad breath. NOTE: If you already suffer from dry mouth, go for products that contain bio-active enzymes. This refers to the average rinse time recommended by the product’s manufacturer. Some brands advise 30-second rinse, while other brands allow for 20-minute rinses. Realistically, products higher in hydrogen peroxide and alcohol will require will require you to use them for a shorter period of times. First, this is because the alcohol creates a burning sensation and does not really allow for longer rinses. Second, these are more potent whitening formulas, so they require less rinse time in order to be effective. Oil pulling whitening formulas are made of natural products and require extensive (10+minutes) rinsing procedures. They do protect your enamel due to the lack of alcohol and peroxide in them. But, they are also way less effective and time-consuming when it comes to teeth whitening. NOTE: If you suffer from sensitive teeth, tooth decay or receding gums, consult with your dentist before using any mouthwash. Also, check out our list of recommended electric toothbrushes to help with that. This product by Crest has a mouthful of a name. It also has a triple action formula that effectively removes stubborn stains from the surface of your teeth, while protecting your gums and destroying bacteria. 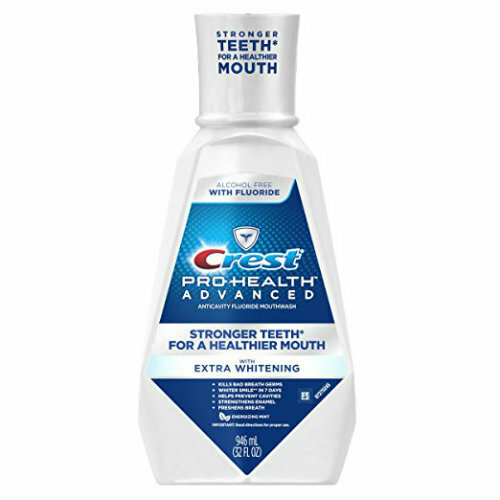 By the description Crest has given the 3D White Luxe, they might as well have named it “The Terminator of Whitening Mouthwashes”. A few Chuck Norris jokes come to mind, but I will refrain from using them in this review. In addition to protecting against germs, this mouthwash has a Whitelock Technology whose purpose is to protect the surface of your teeth from future stains. There is little information on this subject, and how exactly this is achieved. My guess is, that no matter how hard you rinse, there is always some kind of polishing chemical left on your teeth to protect them from stains. The matter of the fact is that if you rinse twice a day, your teeth should not accumulate stains. As a caution, let me just say that the product claims to whiten your smile within 2 days. Even though this is a good product, this claim does not hold true. It will take around 7 weeks of using the 3D White Luxe before any noticeable difference takes place. Only invasive dental procedures can make your teeth whiter in 2 days time. The 3D White Luxe comes with a fresh minty taste. It is not too strong, and it does not leave a burning alcoholic sensation in your mouth. Like other Crest mouthwashes, it is easy to rinse for longer than a minute with this one. The biggest complain regardless this product that I have is its packaging. And in particular, about the cap. It is so hard to open! I rarely get upset at an inanimate object, but this thing really gets me something! This product can also be used with a water flosser. For a complete list of recommended oral irrigators, check out this article. 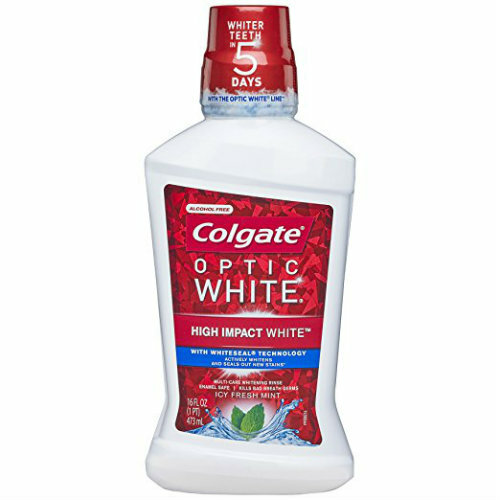 Gentle and non-stinging, the Optic White by Colgate is not a bad choice if you are cool with 2% hydrogen peroxide. Colgate is a well-known manufacturer of oral care related products. It was a matter of time before they join the race for the best whitening mouthwash in the world. And they have certainly done that, but are still behind brands such as Listerine, Crest and several natural products. What I like about Colgate in general, is their open transparency and customer support. The Optic White is not an organic or all-natural product, and so the company does not claim it to be. They know their level of hydrogen peroxide is higher than the recommended 1%, and so they comfortably claim this on their website. Sure, there would be quite a few legal issues if there are no such cautionary warnings. But, those warnings do not need to be on the front of the label. They can be comfortably concealed within a long list of ingredients. Speaking of ingredients, there are no healthy oils and miracle-working salts from the Dead Sea in this mouthwash. Instead, there is the usual glycerin, sorbitol, and some citric and phosphoric acids used to adjust the pH level of the formula. One thing you will not find in Optic White is alcohol. You will have to rely on your hidden living room cabinet for that. When it comes to whitening, this product can do some solid work. Just give it 4 weeks or so to kick in. And, instead of rinsing with 2oz twice a day, rinse with 1oz twice a day. I found that this amount is perfectly capable of removing some stubborn stains, while also making the formula last longer. If you are not a dental care information junky like me, then you most likely have never heard of Essential Oxygen. I do not blame you for that. But, they have an organic whitening mouthwash worthy of a quick mention. To be honest, the first thing that caught my eye was the fact that this product is gluten-free. No other brand advertises their mouthwash rinse products as gluten-free. Besides gluten, this product also has no alcohol, no chlorine bleach, no sodium lauryl sulfate, no fluoride, no pesticides, no glycerin, and the list continues. This is a completely organic product, so you can rinse and gargle with it without losing your mind if your insides will burn should you accidentally swallow a small amount of it. There are no questionable ingredients in this whitening mouthwash. Instead, there is Aloe Vera, purified water, hydrogen peroxide (food grade), delicious organic and essential peppermint oil, rosemary (Rosmarinus Officinalis), a little bit of lemon, leaf oil, and other organic goods. I mean, you can probably use this as a salad dressing. Even though I have not, and I certainly do not recommend that you do! This product is as natural as they come. People have reported that it is great for killing bacteria and fighting the good fight against tooth decay. There are also quite a few positive reviews and reports of successful whitening that usually begins to take place after 6 weeks or so. 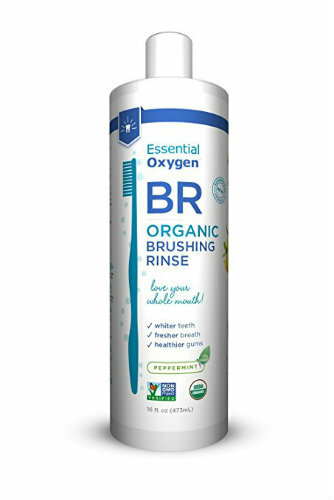 Essential Oxygen has done a remarkable job at pricing this organic mouthwash. At around $9 per 16oz bottle, this can easily compare to any similar product on the market. Considering all of its ingredients are organic, I would say “bravo” for managing such a low price! Coconut oil pulling is a relatively new method used for teeth whitening. It is used as a mouthwash that also has the ability to perform a decent oral detox. The word “pulling” refers to the product’s ability to pull harmful bacteria out of your mouth. Not the most clever name out there, but as long as the product is good, who cares what it’s called! Lauren Naturals have been around for a while and tend to offer one of the most recognized such products on the market. Their coconut oil based oral swish is made out of virgin and organic ingredients. This is always preferable to non-organic products, but it is hard to tell how much of a difference it makes when it comes to whitening your teeth. Much like any other mouthwash, this one contains oral antiseptics. Their purpose is mostly to kill bacteria in your mouth, rather than to reinforce the whitening process. This is why Lauren Natural’s products are quite effective in delivering you fresh breath right after you complete the rinse. Do not expect oily taste in your mouth. Unlike popular belief, this product actually tastes great. In order to achieve high levels of deliciousness, the manufacturer has added natural menthol mint. We have noticed that if you rinse your mouth after smoking, not only will you wash away the bad taste, but your breath will instantaneously improve. This coconut oil pulling mouthwash needs to be used for 6 weeks, twice a day before you see any results. After this period of time, you can expect your teeth to be lightened by 3-4 shades. Which is pretty good for a mouthwash! One thing to keep in mind is that coconut oil hardens at room temperature. So, it is best to keep your coconut oil pulling bottle inside a cabinet. In case the oil hardens, you can just shake the bottle for 10-15 seconds. Advertised as peroxide-free, this product actually contains hydrogen peroxide in its inactive ingredients. NOTE: There have been reports from Listerine customers that this particular product can cause irritation to the gum line and teeth. Our tester does not have any history of sensitive teeth or gums, so it is quite possible that this is a deciding factor. At Dental Dorks we got curious and asked Listerine about their secret behind this supposedly healthy alternative to peroxide stuffed mouthwash products. All we managed to extract from them was that polyphosphates are present in the formula. After that, we noticed that this information was also available in the dark and hidden corners of their website. Polyphosphates is widely known for binding to the proteins in the tooth pellicle. In doing so, this chemical compound helps remove stains from your teeth by absorbing chromophores. Without going into too much detail, the pellicle is a protective film that is being deposited by saliva. However, do not expect to see miraculous results right away. As a matter of fact, this product is rather a slow acting and it might take up to 12 weeks for you to see a difference in the whiteness of your smile. In addition, this product does contain 8% alcohol, so it will leave a burning sensation in your mouth. It is recommended to rinse for 30 to 45 seconds at a time. And I would advise you to use a very small amount after brushing. This particular product tends to create foam in your mouth and makes it harder to rinse if you sip too much of it. If you want to avoid the formation of too much foam in your mouth, rinse gently. I know many of us like to skip the instructions when it comes to products like this. But, try to stick to 30 seconds and sip small amounts of the Healthy White. 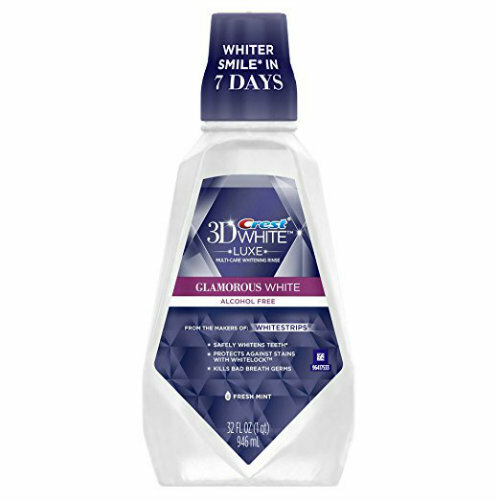 This is one of the very few whitening mouthwash products that actually claims to take longer for it to work than other products. If you head over to oral essentials’ website, you will find that I am not actually joking. The reason this product takes longer (6+ weeks) to show any results, is because it does no use baking soda or hydrogen peroxide. Instead, the main ingredient in Oral Essentials is sea salt, supposedly from the Dead Sea. 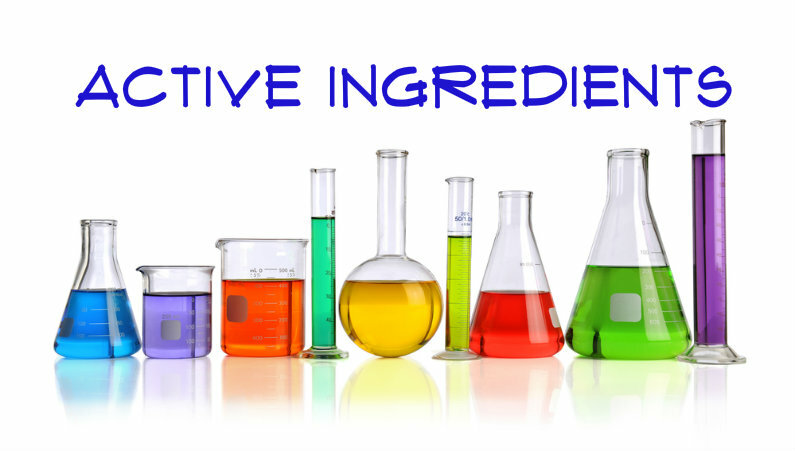 The rest of the ingredients are varieties of oils, such as coconut, lemon peel, clove flower and a few others. None of which should cause any form of concern. 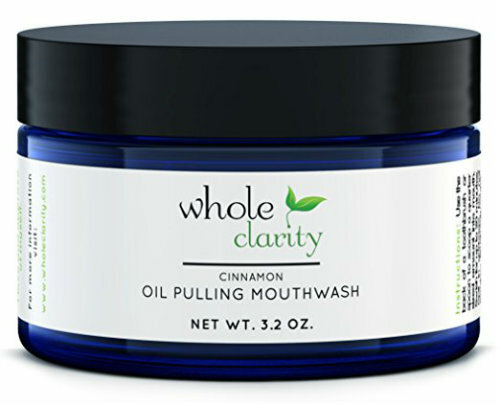 All ingredients used in this mouthwash formula are not the only natural, but also non-toxic and non-GMO. Instead of using fluoride, oral essentials uses Xylitol, a natural agent capable of reducing tooth decay. The mouthwash has a fresh minty taste and it is quite flavorsome. It is alcohol-free, hence it does not have the stinging effect cheaper mouthwashes have. Not containing alcohol also makes it family and children-friendly. Even though you should still not swallow the formula, in case you do, there should be no cause for concern. This is a completely natural product. The worst that could happen is, your burps might taste a little oily and minty. As a side note, the people behind Oral Essentials are two renowned and forward-thinking doctors. Dr. Kourosh Maddahi and Dr. Hessam Nowrazi are published authors and researchers who are well-known to the dental community. If you ever needed a trusted authority to stand behind a product before you buy it, now you have two such authorities. Crest is one of the leading manufacturers of oral hygiene products around the world. Better known for their kinds of toothpaste and whitening strips, Crest has recently joined the battle for the best whitening mouthwash. Needless to say, this is a large company, and when they decide to push out a product, they do it really well. The Pro-Health Advanced Whitening mouthwash is a perfect example of that. If you feel that oral hygiene is an important aspect of your daily health routines, this product is for you. It is especially well-priced when compared to “fancier” products, such as coconut oil pulling mouthwashes. If you compare it to most Listerine products, you will likely find it equally priced. Unlike many other mouth rinsing products, the Pro-Health does not deliver the harsh burning sensation that everybody hates. This is why swishing is much more enjoyable, and you can actually do it for a minute or so at a time. 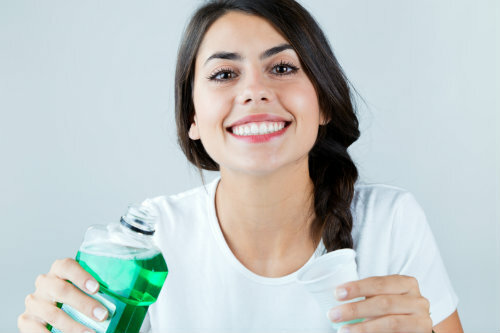 Most mouthwashes need to be spat out after 30 seconds or so because they begin to burn the insides of your mouth. The lack of medicinal taste is definitely something Crest have managed to deliver. One of the reasons there is no burning sensation is that there is no alcohol in this product. I think this is a very positive quality in a mouth washing product. I think we consume enough alcohol as it is. No need to rinse our mouth with it as well! I found that there are fewer incidents of inflammation and bleeding of the gums when using Pro-Health Advanced. Less inflammation also means generally fresher breath. This mouthwash is definitely capable of removing harmful bacteria, without leaving repelling medicinal taste in your mouth. In terms of whitening, the product does what it claims. I begin to see a visible difference in the whiteness of my teeth around the sixth week. This might seem like a very long period of time to some, but in reality, it is not. Not for a mouthwash, anyways. Cool name. It reminds me of the adventures of “Lucky Luke” and his white horse. Not really sure if this has anything in common with the branding of the product, but I felt it was a necessary comment in order to distract your mind from the mundane structure that most reviews follow. And now we are back for another dreary review of another whitening mouthwash that claims to be organic. 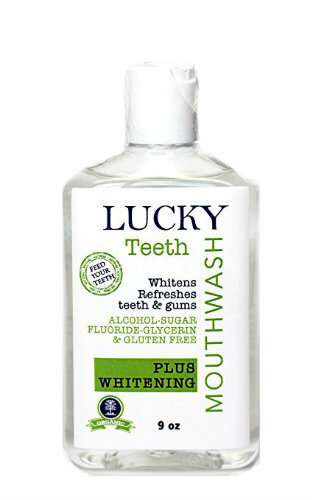 In defense of Lucky Teeth, their mouthwash is indeed free of harmful ingredients, such as alcohol, sugar, fluoride, glycerin & gluten. Not sure how harmful this last one is, since this is a very controversial topic, but in any case, it is not present in this product. Instead, you get a variety of essential oils, some water, some organic peppermint, organic sage, and a pinch of food graded hydrogen peroxide. I know, I know… that last one does not sound very “organic”. However, in this industry, when peroxide is diluted to a 1% strength, can be considered organic. According to the literature, 1% is the recommended percentage of peroxide for mouth washing products. But, if we put the ingredients aside, this is a good-tasting mouthwash. It has a light and pleasant scent that makes it easy to use over and over again. Until the tiny 9oz bottle runs out. Which literally happened in 2 weeks. So, the truth is that I was not able to determine whether or not this mouthwash actually has the ability to whiten teeth and remove stains. The bottle is truly small, and if you rinse twice a day, you will run out after 2-3 weeks. Unfortunately, for an organic whitening product to kick in, you will need to use it for a minimum of 5 weeks. Organic products in any health-related industry are generally more expensive, and this mouthwash is no exception. Lucky Teeth’s 9oz bottle is more expensive the Crest’s 12oz bottle. So, if purchasing this for teeth whitening purposes, you might want to consider getting two bottles from the start and perhaps saving a dollar or two on shipping costs. 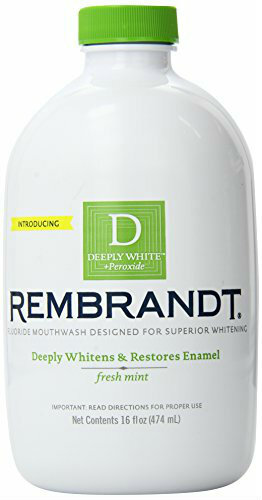 Cleverly (or not) named after the ingenious Dutch painter Rembrandt, this is a fairly new whitening product. Previously, this brand has concentrated on whitening strips, kinds of toothpaste and rubbing solutions. This is their first mouthwash. The presence of hydrogen peroxide and sodium is supposed to achieve the whitening effect for you. That is if you have the patience to use this product for 5 weeks or more. We found this to work well if mixed with other whitening products, such as a Colgate toothpaste. The recommended dose for swishing is two teaspoons, but you can get away with one. The taste is not very strong, it is rather pleasant despite the tiny tingly and burning sensation. Not sure why, but this mouthwash is very hard to find. It is consistently out of stock, no matter where you try to look for it. This could be either because it is very good, or because it has been discontinued. We last got a hold of it in April of 2017. In any case, if you do not care much for natural and organic products, you might want to give the Rembrandt a chance. That is if you can find it on the shelves. Whole Clarity is a holistic healing brand. As such, their mouthwash is made out of a variety of natural ingredients. The presence of peppermint and tea tree essential oils give this product a relatively good taste. All other oils are meant to help whiten the surface of the teeth. 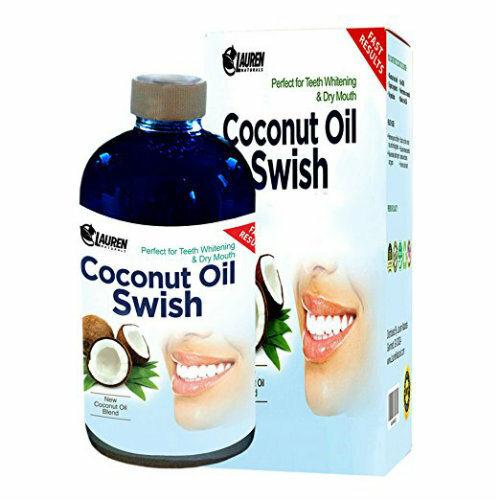 The only downfall, with this and other oil pulling products, is that you have to swish for 20 minutes at a time. I find this extremely difficult, and time-consuming. Especially if it needs to be done twice a day. At most, I was able to go up to 5 minutes of swishing, before my jaw got tired and I had to spit out the formula. If you are simply looking for a whitening solution, it is probably best to go with a regular mouthwash and keep away from oil pulling. I have personally given up on oil pulling not because it does not work, but because I cannot get it to work. NOTE: This is not a recommended mouthwash! 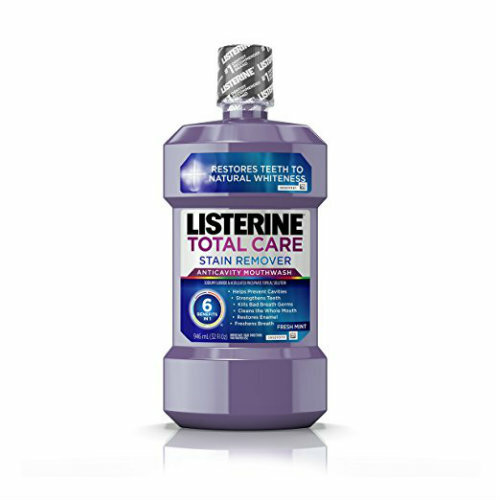 Advertised as the complete mouthwash on the market, the Listerine Total Care has faced some serious opposition from reviewers. If you do not speak much “science”, the only ingredient you are going to recognize is water. Everything else that is stacked in this bottle, will make your mouth fizz and your tongue burn. The 21.6% alcohol is enough to give you a buzz if you rinse once before work. One of the 6 benefits that are claimed on the Total Care bottle, is that it will visibly whiten your teeth. As I was getting ready to continue using this product, despite its vile taste, I came across some vital information released on Listerine’s website. It literally says “whitening results expected at 12 weeks”. There was no way I could make a commitment to using this mouth burning chemical disaster for 3 months! So, I moved on. I would suggest you do the same. This product may be great for killing germs, preventing cavities, and restoring enamel, but I cannot recommend it for teeth whitening. Supersmile is not a widely popular brand name amongst oral care products. Originally started by Dr. Irwin Smigel, this whitening mouthwash is far away from becoming one of my favorite products. In all honesty, this product has enjoyed some positive reviews. In my personal opinion, one too many. The ingredients found in Supersmile’s mouthwash are quite typical for any cheap mouthwash. The only distinguishing mark that this project has is the white bottle that it is packed in. Other than that, baking soda, hydrogen peroxide, and malic acid are quite standard ingredients for any mouthwash that aims to burn your mouth while rinsing. This is not a product that you want to end up accidentally swallowing because it might end up taking you to the emergency. The burning, strongly metallic, and acidic taste makes me think that this product was not tested on living subjects prior to its launch. It left a burning sensation in my mouth for some 30 minutes after rinsing with it for 30 seconds. A horrid film tends to form inside the mouth and it is not easy to get rid of. Considering that this product has been around for more than 9 years, I am willing to accept the possibility that perhaps I got a bottle from a bad batch. Even so, calling the customer support did not solve my problem, as they simply claimed that there is nothing wrong with the product. Not sure how they were able to establish this over the phone. Either way, I will not be buying Supersmile whitening mouthwash again, and so I cannot recommend that you do. In any case, there is a link where you can read other people’s review in order to better form your own opinion. 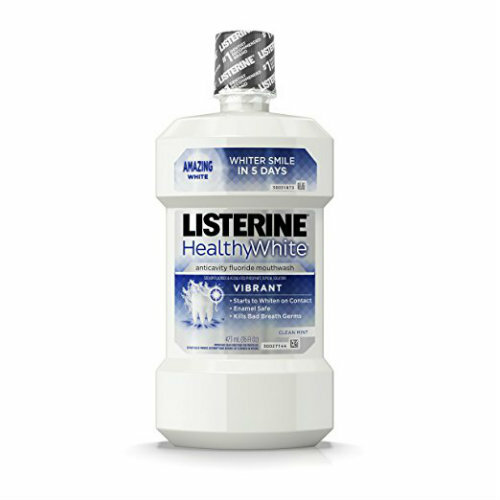 Listerine Healthy White Vibrant DOES have peroxide in it. It has “Active Dental Peroxide” in it, as well as normal hydrogen peroxide. Now I do not know if “Active Dental Peroxide” and hydrogen peroxide are the same thing but there you have it. Per the back of the bottle: “Contains Active Dental Peroxide which releases oxygen while whitening.” This is what causes the mouthwash to really foam up in your mouth while using. Also, all of these whitening mouthwashes say not to drink or eat anything for at least 30 minutes after use. Hi, Dental Dorks! Thanks for publishing this article. 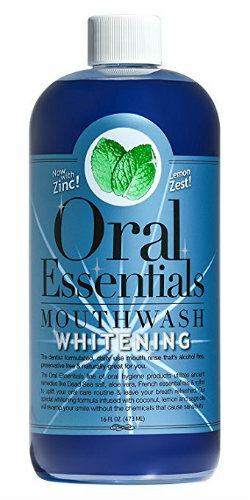 I just started using Oral Essentials Whitening Mouthwash, developed by those 2 dentists you mentioned. I’m almost to the end of the bottle, and didn’t see enough results at first, but I also just added a healthy coffee to my diet (didn’t drink coffee before) and whoa, does coffee stain teeth quick! And I noticed the teeth staining after only 4 cups/one per day. So in all fairness toward Oral Essentials, it has a lot to fight through toward whitening my teeth right now. One thing I noticed is OE recommends rinsing 2-3 times a day, for 60 seconds each time. I’m going to say, yes, you need to do the THREE times/day and OVER 60 seconds. When you go over, you see a slight, immediate brightening and shinier teeth. Before trying this, I always used food grade hydrogen peroxide, and it worked well to keep my teeth from yellowing. A friend mentioned her dentist told her that with repeated use, it can kill even the good bacteria in the mouth and lead to a bacteria that causes what appears to form like “black hairs” on the tongue, as well as gum recession. What are your thoughts on this? I’d love to go back to a rinse containing food grade hydrogen peroxide, but want to make sure I do it safely. For example, when you say 1% hydrogen peroxide, does that mean the hydrogen peroxide only makes up 1% of the mouthwash formula? Or does it mean the hydrogen peroxide used is a 1% part hydrogen peroxide, and the rest water? That’d be awesome if you can help us understand, as I wonder if a very tiny amount of hydrogen peroxide can be used safely over a long period of time? And how to make sure it’s a small enough amount? Also, is there any way we can build up the good bacteria in our mouths?